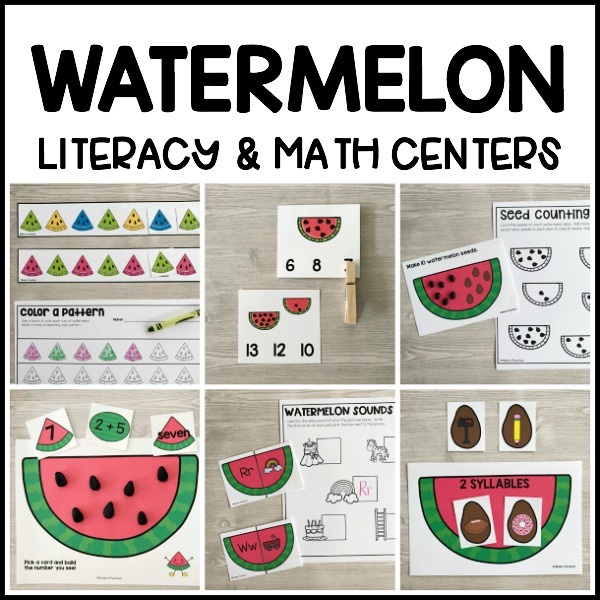 Our WATERMELON Literacy & Math Centers are the perfect way to celebrate traditional summer activities! These printable activities fit perfectly into your summer plans or even during a restaurant theme. 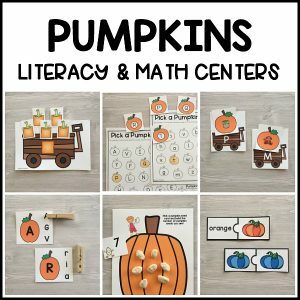 Little learners in preschool, pre-k, and kindergarten will stay engaged and motivated through the theme with our printable WATERMELON literacy & math centers. As always, the watermelon themed learning centers include super low prep literacy and math activities full of EASY to follow directions. 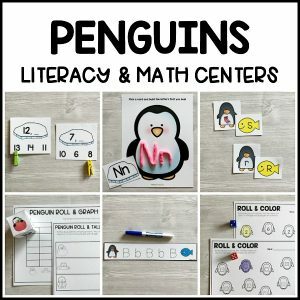 This makes these learning centers perfect for preschool, pre-k, and kindergarten. 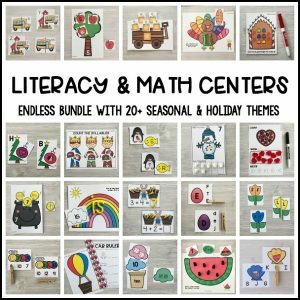 The watermelon literacy & math centers are part of the ENDLESS Themed Literacy & Math Centers Bundle. Grab the amazing bundle now! Read details about more than 12 WATERMELON Literacy & Math Centers for your summer theme in the descriptions below. 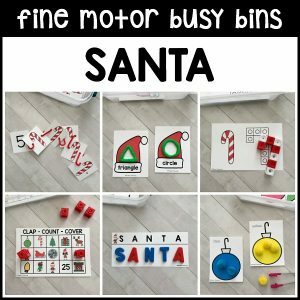 Photos of the activities in action can be found above, where you can see some of the variations included in these printable learning centers. 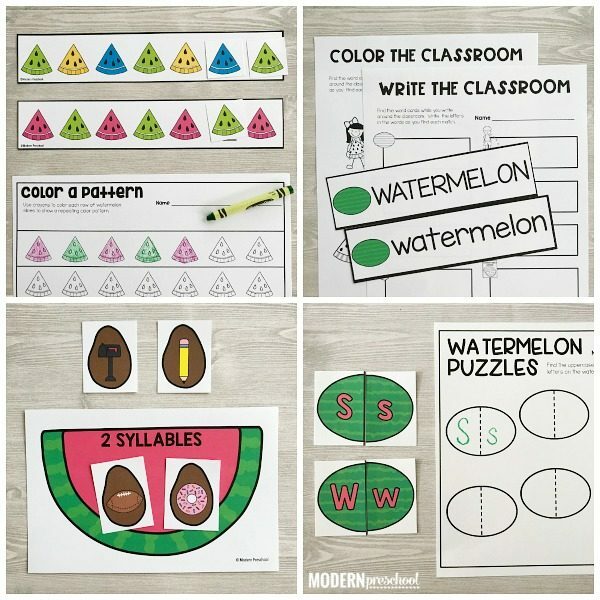 Watermelon Vocab & Write the Room – 10 themed vocabulary word cards are included in both uppercase and lowercase versions. Use the cards in your writing area, during science, or along with circle time. There are 3 Write the Room recording papers (trace uppercase words, trace lowercase words, write the words on your own) and Color the Room recording sheets included to differentiate instruction. “Watermelon Seeds” – includes repetition, sight words, predictable words, and themed words. Includes 2 pages per piece of paper to make copying and assembling books super simple! “Seeds” (mini) – 3 words per mini page with use of the repetitive use of sight words and a watermelon themed word in the reader. In this mini book, the entire reader is printed on one page. Practice the predictable words with clues from the pictures. Watermelon Seed Syllable Sort – Pick a watermelon seed, identify the picture on it, and clap the syllables in the word. Find the correct watermelon syllable mat that has the same number on it as the syllables in the picture, and place it on that mat. Watermelon Initial Sound Puzzles – Match the letter half of the watermelon with the half that has the picture that begins with that letter. After matching up all 26 watermelons, use the recording sheet to write down some of the letters while practicing initial sound skills. 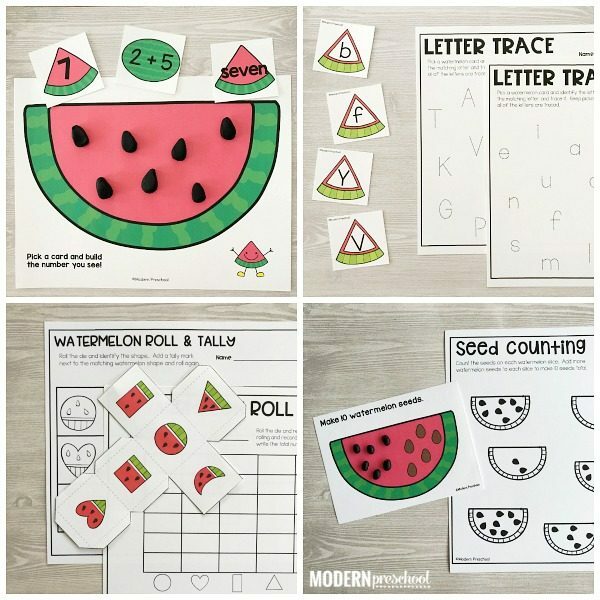 Watermelon Letters Pick & Trace – Choose from the uppercase or lowercase set of letter cards to pick a card and find the matching letter on one of the the recording sheets. Trace that letter on the recording sheet and pick another letter card. Watermelon Alphabet Match – Put together the watermelon sides to correctly to match up the uppercase and lowercase letters. After making all of the matches, record some of the matches on the recording sheet. 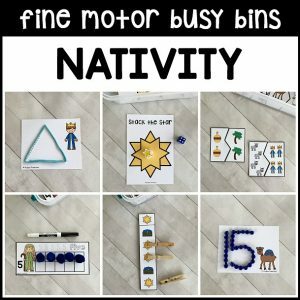 Number & Addition Play Dough Mats – Includes 3 sets of cards – numerals, number words, and addition problems – to practice number skills while adding the correct amount of watermelon seeds to the play dough mat. Make play dough seeds, the number, or the number word on the mat. Watermelon Shape Roll & Graph or Tally – After cutting out and putting together the watermelon shape dice, roll a die and identify the watermelon shape showing. Color in the graph or add a tally mark to the recording sheet. 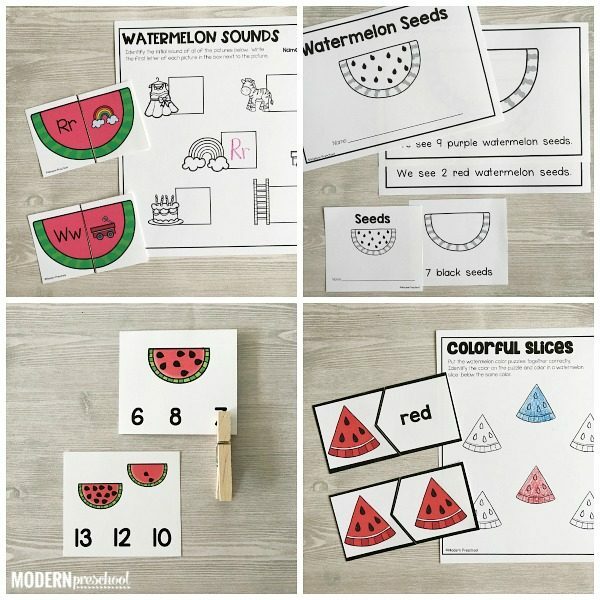 Watermelon Seed Count & Clip Cards (1-20) – Count the seeds on the watermelon on the cards and then choose the correct number from the choices on the bottom of the card. Clip the number with a clothespin and pick another card. Watermelon Color & Color Word Puzzles – Choose to use the set of color/color or color/color word puzzles to put together correctly. Create a color puzzle and then color in one of the watermelon slices on the recording sheet. Watermelon Color Patterns – Finish each pattern of watermelon slices practicing AB, ABC, and ABB patterns. Create your own patterns on the recording sheet practicing the skills being used with the pattern strips. Make 10 Seeds Math Cards – Add enough watermelon seeds to each watermelon to make 10. Use dried black beans or dry erase markers to add the seeds. Use the recording sheet to color in the number of seeds needed on each watermelon to make 10. Keep the juicy, sweet learning going with our Watermelon Fine Motor Busy Bins! If you don’t already own any of the busy bin themes, you have to check out this one!